Note from the LeftEast editors: As we move towards the 2018 parliamentary elections in Hungary, the Momentum Movement, recently chartered as a party, is being touted in the international liberal media as a pro Europe party with potential to threaten the right-dominated political space where the main challenge to Fidesz comes from the extreme right party Jobbik. After becoming known this spring through it’s a successful campaign against Hungary’s the government’s plan to bid to host the 2024 Olympics, Momentum is now poised to run in the elections. Momentum drives a campaign designed by communication professionals, rejecting political identification, and offering technocratic solutions “instead”. As their slogan states, they want to build a country that is “not torn apart by ideologies, but kept together by common goals”. The identification of “common goals” apparently happens by statistical analysis of public opinion, which in turn is shaped by the unanimous dominance of right-wing government media, and its raging xenophobic campaigns. The party’s positions on political issues express “common sense” ideas carefully measured to statistics of their target group. The recent comments by Momentum’s spokesperson on the issue of migration, to which the following open letter reacts, was but one in a series of campaign statements that aim at this carefully balanced position tailored to statistical common sense: “there is a need for the fence, but we need to be in solidarity with both the soldiers who work there and with the refugees who are there and are willing to go through the truly legal process (sic) that would allow them to acquire refugee status”. While Momentum is often praised in international liberal media as the left-wing challenger of Hungary’s strong right wing, G. M. Tamás argues that Momentum represents a “new brand of politics” – a party project built on communication expertise and the expressed denial of taking a political position. At the same time as “they go against the anti-democratic, anti-liberal, anti-egalitarian measures of the government”, they “conform to a widespread prejudice that there are indeed some anti-nationalist forces operating, destroying the backbone of our nation, and selling us off to Europe, represented by the left and liberal parties that have played a role in political life since 1989. We maintain that such a project cannot represent a real alternative to the present situation, where the major opposition party to Fidesz is extreme-right party Jobbik. Neither a liberal nor a left alternative is possible without refusal, as the Migrant Solidarity Group of Hungary (MigSzol) writes, to “go down the road paved by Fidesz”. Below we post with MigSzol’d permission, it’s “open letter to Momentum”. It was originally published in Hungarian in Kettős Mérce , and can be found in English on the MigSzol blog. 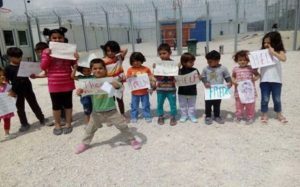 A group of children raising slogans criticizing their “miserable” conditions at Tompa camp in Hungary. Life in the transit zones is criminalised as people are detained behind bars and razor wire during the entire duration of their asylum procedure – the latest legal development that Fidesz introduced only in March 2017. People staying in the transit zones are being constantly humiliated, living for months in a non-airconditioned container with one window. Often, large families are lumped together, their only alternative being to spend their day in a small inner courtyard with no shadow whatsoever. People are handcuffed when they need a doctor and are accompanied by armed security guards carrying batons and sprays anywhere they go within the detention complex. We recommend this reading from the Hungarian Helsinki Committee for all members of Momentum still considering what their stance is. Migszol does not necessarily agree with all these suggestions either, but at least this one was written by real experts – those experts, whose opinion also the Fidesz government has ignored ever since seizing power in 2010. T​he fence does not only cost dearly tax payers money – it also makes the cost of border crossing higher for refugees both physically and in hard currency. It creates lucrative business opportunities for smugglers, and exposes people attempting to cross the border in irregular ways to horrific violence. So now, the options are smugglers or transit zones. In addition, the normalization of the fence further increases fear, a fear of what is “out there”, of what we don’t know, and this is exactly what Viktor Orbán wants. These sentiments are echoed also in his speeches on ethnic homogeneity and his false opposition of Christianity and Islam. Last but not least, for the tiny population of migrants and refugees in Hungary (around 0.4 percent of the country’s population), the fence stands as a constant reminder that they are not welcome – and even if they are, they are welcome as “exceptions”.